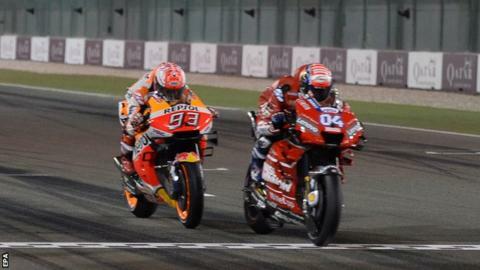 Italian Andrea Dovizioso captured the season-opening Qatar MotoGP for the second year running, thwarting world champion Marc Marquez. The two riders swapped positions on the final lap but Dovizioso, who led for much of the race on his Ducati, sealed victory by just 0.023 of a second. Britain's Cal Crutchlow seized on a late mistake from Suzuki's Alex Rins to take third on his LCR Honda. Maverick Vinales, who started in pole position, finished seventh. Italian veteran Valentino Rossi, the seven-time champion now aged 40, finished fifth - just six tenths of a second behind Dovizioso - after starting 14th for Yamaha. Marquez, who started one place behind Dovizioso in third on the grid, pounced on the tenth corner of the final lap to take the lead, before the Italian immediately regained the advantage. "I don't know, it was a strange race," said Dovizioso. "Overall, I am so happy." Meanwhile, teenager Kaito Toba became the first Japanese rider to win in Moto 3, with Italy's Lorenzo Dalla Porta was second with Spain's Aron Canet third. There was also a close finish in the Moto 2 race with Italian Lorenzo Baldassarri just edging out Switzerland's Thomas Luthi to win. German Marcel Schrotter, who started on pole, took third place.